In today's blog post we take a look at South Africa's exports of Ores and slashes (most Iron Ore) and then products of Iron and Steel. The reason we are looking at this is due to the US slapping import tariffs on these products being imported into the US from both the EU and Canada and Mexico. So just how much of this type of product do the USA import from South Africa and will it affect South Africa's trade in these products with the USA? The chart below shows the monthly Rand value of Ores and Slashes being exported by South Africa to the United States and China. Thus China as export market for Ores and Slashes from South Africa is roughly 13times the size of the market provided by the United States. So will South Africa feel the hit if tariffs were imposed on their exports of these products to the USA? Well not really, as the US market is very small compared to China for example, so should tariffs affect demand of these products from South Africa, we doubt it will have a significant impact on the companies exporting to the USA as they would easily be able to offset declining volumes in the US in other markets such as China. 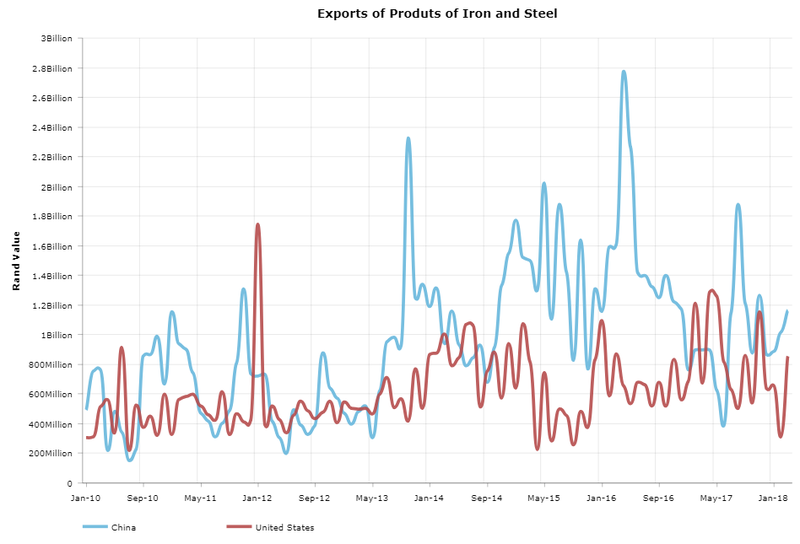 The chart below shows the money Rand value of South African exports of products of Iron and steel to both the United States and China. And the size of the two markets are a lot more similar compared to the market for Ores and slashes. So in the case of Iron and Steel, South Africa companies might be hit a lot harder if tariffs were imposed and demand for these goods from South Africa falls, as the Chinese market for these items doesnt look a lot bigger than the US market, so South African supplies might find it a lot harder to offset these products in other markets if it cant sell more in the US, or if demand in US drops and SA firms sit with excess stock it needs to sell.